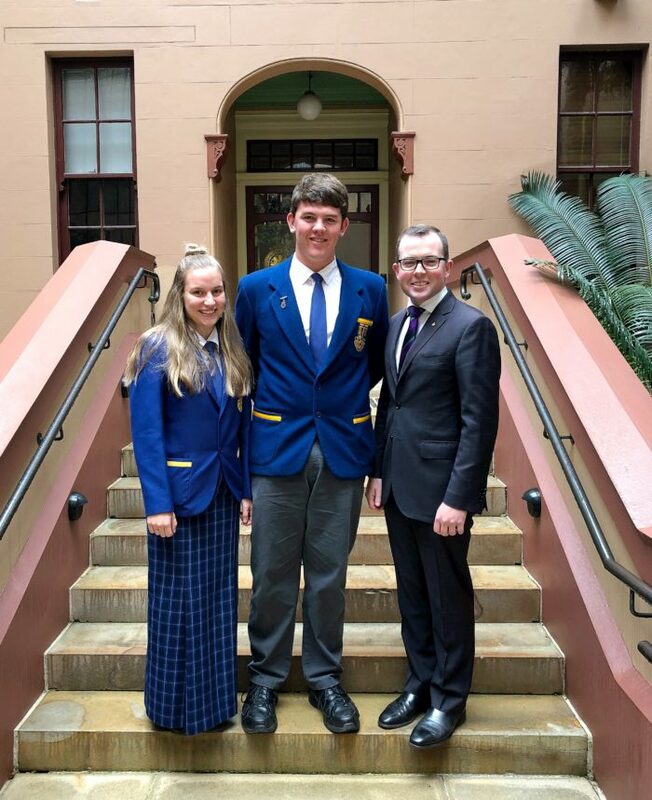 Northern Tablelands MP Adam Marshall pictured on the steps of State Parliament yesterday with Glen Innes High School captains Karli Henderson, left, and Stuart Wright. STUDENT leaders from Glen Innes High and Emmaville Central Schools got a taste for NSW politics yesterday in Sydney, during a tour of the oldest Parliament in Australia. School captains Karli Henderson and Stuart Wright (Glen Innes HS) and Shyanne Sturtridge and Adam Young (Emmaville CS) were hosted by Northern Tablelands MP Adam Marshall during a Secondary Student Leadership Program, conducted by the NSW Parliamentary Education Branch, which included a visit to Government House. “Karli, Shyanne, Stuart and Adam were exceptional ambassadors for their schools and the Glen Innes and Emmaville communities.